Q: Two Canadians have now been taken into custody in China. Both have been accused of allegedly endangering China's national security. There are many charges possible for endangering national security. What are Michael Kovrig and Michael Spavor accused of doing wrong? A: The information I have is that on December 10, the Beijing State Security Bureau and the State Security Bureau of Dandong City, Liaoning Province have respectively taken compulsory measures on Canadian citizens Michael Kovrig and Michael Spavor in accordance with the Criminal Law of the People's Republic of China and the Criminal Procedure Law of the People's Republic of China on suspicion of engaging in activities that harm China's state security. These cases are still under investigation. The Beijing State Security Bureau and the Liaoning State Security Department have respectively informed the Canadian Embassy in China of these cases. The legitimate rights of these two people are guaranteed. Q: According to reports, in a recent diplomatic consultation between China and Pakistan, Pakistani Foreign Secretary Tehmina Janjua told Vice Foreign Minister Kong Xuanyou that the China-Pakistan Economic Corridor is a "national priority" for the government and Pakistan remains committed to the successful implementation of CPEC. The two sides also agreed to expand CPEC cooperation to new areas. Can you confirm that? Could you give us more details about this political consultation between the two sides? A: I would take your second question first. 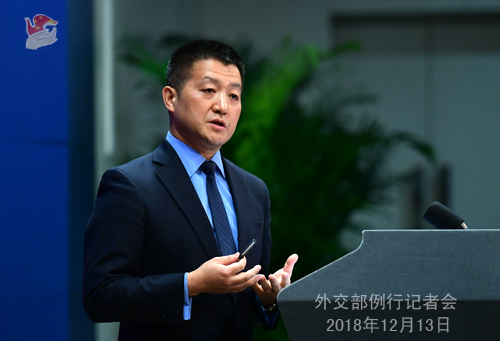 At the invitation of Pakistani Foreign Secretary Tehmina Janjua, Vice Foreign Minister Kong Xuanyou recently traveled to Pakistan for the China-Pakistan diplomatic consultation. The two sides exchanged in-depth views on bilateral relations and international and regional issues of mutual interest and reached consensus in the following aspects: first, we will maintain high-level interactions; second, we will deepen strategic communication and continue to engage in dialogues and consultations at various levels; third, we will strengthen economic and trade cooperation and advance the second-phase negotiation on China-Pakistan free trade agreement; fourth, we will enhance the building of CPEC and promote it to a stage of high-quality development with concrete industrial cooperation and expand it into other regions in Pakistan; fifth, we will conduct closer communication and coordination on international and regional affairs to uphold common interests. The two sides also strongly condemned the terrorist attack targeting the Chinese diplomatic institution by the Pakistani terrorist force and agreed to step up anti-terrorist cooperation and safeguard the development of CPEC as well as the safety of Chinese institutions and personnel in Pakistan. The Pakistani side did make these statements as you just mentioned. The relevant remarks fully demonstrate the high consensus between the two sides on developing our bilateral relations, in particular on deepening the CPEC cooperation. China applauds Pakistan's decision to take CPEC as a "national priority" and believes that with the concerted efforts from both sides, CPEC will continue to make new progress and deliver more benefits to the people of the two countries as well as those living in the wider neighborhood. Q: Can you tell us if the two investigations on Michael Kovrig and Michael Spavor are separated or related? A: I have made my points clear. In terms of the nature of the two cases, these two persons are both suspected of engaging in activities that harm China's state security. They have been taken compulsory measures respectively by the Beijing State Security Bureau and the State Security Bureau of Dandong City, Liaoning Province. Both of them are still under investigation. Q: Are these investigations into these two Canadian nationals related to or retaliation for Canada's arrest of Huawei CFO Meng Wanzhou? A: As for Canada's wrongful detention of Ms. Meng Wanzhou, we have made clear our position. As for these two Canadian citizens who have been taken compulsory measures by China's state security authorities, I can assure you that the Chinese side will act in accordance with laws and regulations. Q: I know that both had worked on issues related to the DPRK. Can you tell us if their actions that are suspected of endangering national security are related to the DPRK? A: Like I just said, in terms of the nature of these two cases, these two persons are suspected of engaging in activities that harm China's state security. As for other information you've asked, I have no information to offer at the moment. These cases are under investigation. Q: Are there other Canadians being investigated by the Chinese State Security this week that we should also be aware of? A: You have heard of more? (Journalist: no.) I haven't heard of it as well. Q: The three ethnic armed groups in northern Myanmar, namely, the National Democratic Alliance Army (NDAA), the Ta'ang National Liberation Army (TNLA) and the Arakan Army (AA) issued a peace statement in Kunming yesterday, saying that they are willing to engage politically in Myanmar's reconciliation and peace process. What's your comment? A: After positive dialogues and negotiations, the Myanmar government and the three northern Myanmar ethnic armed groups, namely the National Democratic Alliance Army (NDAA), the Ta'ang National Liberation Army (TNLA) and the Arakan Army (AA), have reached consensus on the three ethnic armed groups issuing a peace statement. The three ethnic armed groups said that they are willing to resolve problems with the Myanmar government and military through dialogue and take part in Myanmar's reconciliation and peace process through political means. This marks important positive progress in Myanmar's peace process and China welcomes and supports that. As a friendly neighbor to Myanmar, China supports the Myanmar government in continuously promoting the comprehensive and inclusive peace and reconciliation process and hopes that all parties in Myanmar will continue to meet each other halfway to advance talks and realize national peace and development at an early date. China stands ready to continuously play a constructive role to this end. Q: This year marks the 17th anniversary of China's accession to the World Trade Organization. We noted that WTO spokesperson Keith Rockwell said in an interview that it's extremely important to have China as a WTO member, who has acted as a firm advocate of the rules-based multilateral trade system. What's your comment? A: We have noted these pertinent remarks Mr. Keith Rockwell made on the role China has played as a WTO member. This year marks the 40th anniversary of China's reform and opening-up. China's accession to the WTO 17 years ago, as a milestone in that great journey, has had enormous and far-reaching influence on China and the world at large. Over the past 17 years, China has followed the WTO rules, honored its commitments, and comprehensively fulfilled its promises of opening-up in terms of lowering tariffs for goods, removing import quotas and other non-tariff barriers, liberalizing the access to foreign trade operations and opening up service market. Deeper integration into globalization has not only made China the biggest global trader in goods and accelerated China's process of economic development and poverty alleviation, but also enabled it to share more development opportunities with the rest of the world and made important contributions to promoting trade and well-being for all. Over the past 17 years, China has taken part in and supported the work of the WTO in an all-round way, and vigorously advanced trade liberalization and facilitation by taking a lead in signing the Trade Facilitation Agreement. China has also firmly supported the rules-based multilateral trading system, promoted the vital role of the WTO in global economic governance and supported more developing countries in integrating into and benefiting from the economic globalization process. Having said all these, there are also regrets over the past 17 years. While the overwhelming majority of countries approve China's enormous contributions to promoting international trade and upholding the multilateral trading system, a small number of others still choose to ignore these contributions and even refuse to fulfill their obligations under Article 15 of the Protocol on China's Accession to the WTO and continue to treat China unfairly. The multilateral trading system now stands at a critical juncture and faces heavy impact from unilateralism and protectionism. China will stay committed to the path of multilateralism and support the WTO in making necessary reforms. We have published a position paper on the WTO reform not long ago, with emphasis laid on three principles and five propositions. We will work with other WTO members to uphold the core values and basic principles of the WTO and improve its authority and effectiveness so as to help it better fit into the future development of international trade. In the meantime, China will push forward its new round of high-level opening-up and join others in building an open world economy for mutual benefit and win-win results. Q: You mentioned the two Canadians' cases are being dealt with in accordance with the law. Can you confirm they have been given access to lawyers and have they been formally arrested? A: Like I just said, these two cases involving two Canadian citizens suspected of undermining China's state security are still under investigation. So, not all of the details can be revealed here. As for whether they have access to lawyers, I just said that their legitimate rights and interests are guaranteed. Q: Can you clarify if their detentions or investigations were based on violations of China's NGO law? A: I just said that they are suspected of engaging in activities undermining China's state security. Q: Under the consular agreement between China and Canada, has the Canadian Embassy been formally given reasons for them to be investigated or it just has been informed that they are being investigated? A: Like I just said, the Beijing State Security Bureau and the Liaoning State Security Department have respectively informed the Canadian Embassy in China of these two cases, in accordance with the consular agreement between China and Canada. I have no specific details. Q: China has called for the immediate release of Meng Wanzhou. If the Canadian court were to release Meng Wanzhou, would China release Michael Kovrig and Michael Spavor? A: I have made my points pretty clear. On the case of Meng Wanzhou which is a wrong move made by the Canadian side, we ask the Canadian side to immediately correct its mistake and release Ms. Meng Wanzhou. As for the cases involving two Canadian citizens, I have already told you that China's state security authorities have taken compulsory measures in accordance with law. Q: Could you tell us the exact date when China informed the Canadian Embassy of the two detention cases? A: As for these details, I would refer you to the competent authorities. 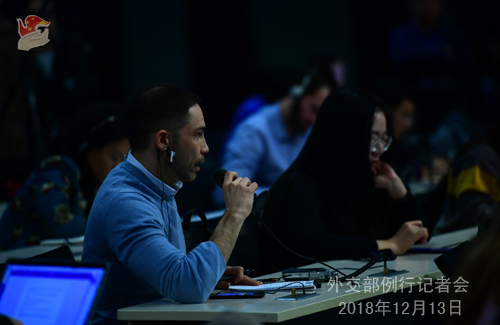 As far as I know, the Beijing State Security Bureau and the State Security Bureau of Dandong City, Liaoning Province have respectively taken compulsory measures on Canadian citizens Michael Kovrig and Michael Spavor on December 10. 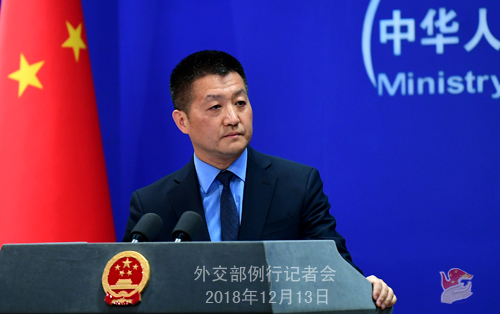 After going through due procedures, the Chinese side notified the Canadian Embassy in China without delay in accordance with the consular agreement between the two countries. Q: I am wondering what you would say to critics who argue that these detentions are politically motivated? I know China said that it was not politically motivated. What do you say to critics who said that they are? A: You've answered your own question for me. Q: There are other Canadians who live in China who are saying that they feel nervous now. They feel as if they could also be taken into custody. What is the message of the Chinese government to other Canadians living in China right now? A: I don't know where you heard of that. We all know that China always holds a positive and open attitude towards exchanges with other countries. I said here yesterday that we welcome foreign tourists and foreign nationals to come and visit. There will be no problem at all for normal and friendly exchange activities, including business and education activities. I also said that there is in fact nothing to worry about as long as they abide by Chinese laws and regulations. After yesterday's press conference, I found time to check out some numbers. Whether China is safe for the Canadians or not can be ascertained by facts. From January to November 2018, 780,000 people have travelled from Canada to China, which means that considering there are over 30 million people in Canada, 210 out of every 10,000 Canadians have visited China. Frankly speaking, this number far exceeds that of Chinese nationals travelling to Canada, and it is illustrative to some point. Whether China is safe for them or not, the Canadians are the best judge of that. Meanwhile, I want to add that since the Canadian government wrongfully detained Ms. Meng Wanzhou at the behest of the US side, many Chinese people are starting to question the safety of travelling to Canada. Q: We are starting to hear some reports that the Canadian business people in China are having difficulty with some of their business dealings with Chinese companies. Have there been any instructions to Chinese companies to delay or hold back or cancel some of their business dealings with Canadian companies? A: First of all, I haven't heard of such instructions. Second, it does not sound like our Chinese people's way of doing things. As for where you heard of such things and why they reach such a conclusion, you may have to ask those who harbor these thoughts. Q: The Canadian government's response has been that legal processes are separated from political processes. And the case on Ms. Meng Wanzhou is not something that the Canadian government can politically influence. What is China's view on this argument? A: Whether the Meng Wanzhou case is a legal matter or political matter, the Canadian government knows it better than anyone else. Q: If these two Canadians are detained by the Ministry of State Security, what are the provisions for their release or bail? How long could they be held without being formally charged? A: First of all, I need to correct you that I didn't say the Ministry of State Security. I said the Beijing State Security Bureau and the State Security Bureau of Dandong City, Liaoning Province. As for what happens after the compulsory measures, I must say that the relevant State Security authorities will act in accordance with law. These cases are still under investigation. I shall not attempt any prejudgments here.